Scentinel Nose Work Dog Training offers K9 Nose Work™ classes to pet dogs whose owners want to enrich their dogs lives or who want to learn more about the new dog sport, called K9 Nose Work™, that is taking the country by storm. As a dog smells scent like we see color and is born knowing how to use its nose, K9 Nose Work™ Classes will not teach a dog “how” to follow scent so much as they will teach us how to communicate to the dog on what specific thing we want the dog to focus those superior scenting abilities. To do that, we will tap into your dog’s natural desire to hunt and we will positively reinforce this hunting behavior with a reward system that your particular dog loves, such as a highly-valued toy, special food and sincere praise. K9 Nose Work™ Classes are exhilarating for both dog and handler and they can help develop confidence even in the most timid of dogs. And, the mental exercise of searching and problem-solving is great for calming down other, more energetic or reactive, dogs. Finally, a huge benefit of the K9 Nose Work™ Classes is the positive working relationship that develops between you and your dog when you both are out “hunting” together as a team. And, for those handlers that love to compete, our series of K9 Nose Work™ Classes with Gail McCarthy, Certified Nose Work Instructor™ will help prepare you for upcoming K9 Nose Work™ Trials in the New England area. 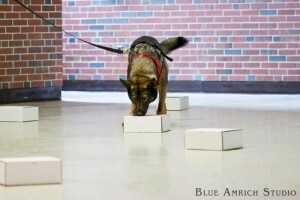 Check out the official K9 Nose Work™ website to learn all about it. Rules and regulations can be found at the “National Association of Canine Scent Work” website.